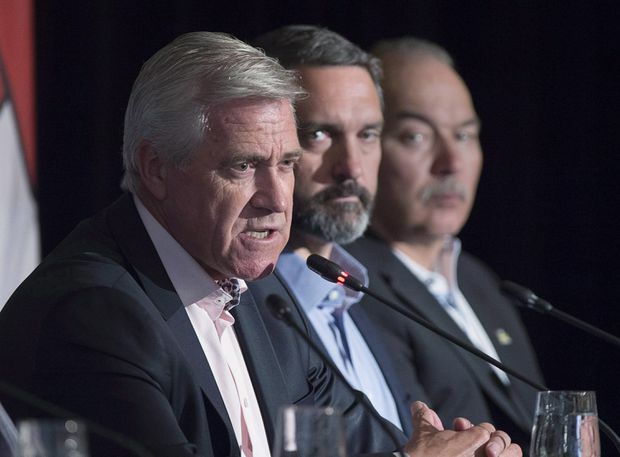 The Government of Newfoundland and Labrador struck a financial agreement with two international oil companies to develop the province’s first deep-water production project and open a new frontier in the East Coast offshore industry. Premier Dwight Ball announced on Thursday the province agreed to fiscal terms with Norway’s state-owned Equinor ASA (formerly Statoil) and Husky Energy Inc. on the deep-water, $6.8-billion Bay du Nord project, which is believed to contain more than 300 million barrels of recoverable crude. The companies are not expecting to make a final investment decision on the project until 2020 and will be undertaking further exploration and development work to reach that point. Based on forecasted US$71 oil price in 2025, the province said it would receive some $3.5-billion in royalties, taxes and profits over 14 years, assuming production reaches 150,000 barrels a day after 2025. Provincially owned Nalcor Energy is buying a 10-per-cent equity stake in the project, which is currently split 65-35 between Equinor and Husky. The companies propose to use a floating production system to produce light crude from the Bay du Nord field, with an underwater tie-in from the nearby Baccalieu field, where oil was discovered in 2016. Unlike existing offshore projects such as Hibernia or the newly commissioned Hebron that are on the continental shelf, the Flemish Pass discoveries lay in 1,200 metres of water, some 500 kilometres east of St. John’s. Equinor has other discoveries in the area and spokesperson Alex Collins said the company is evaluating its drilling plans for the area for the next several years. The agreement represents a shot in the arm for the province’s offshore industry, which has had no committed projects under development since the completion of Hebron in November, 2017. Equinor plans to invest $75-million in the province to enhance local expertise in subsea and deep-water development. If the project proceeds, the companies committed to having five million tonnes of steel fabrication done in Newfoundland, as well as a set amount of drilling to further delineate the potential of the Flemish Pass. Ms. Collins said the future of the project depends on how competitive it is with other investment opportunities the companies have in their inventory and with other sources of production globally. In June, the partners submitted a project description for environmental assessment with the Canada-Newfoundland and Labrador Offshore Petroleum Board. Deep-water oil producers have slashed their costs since the 2014 crude-price meltdown, as the industry as a whole has worked to cut capital costs. “Equinor has significantly taken down cost and improved our project portfolio in recent years,” Ms. Collins said. The break-even price for its development portfolio is US$21 a barrel, she said, while a similar portfolio had a break-even of around US$70 in 2013.